The difference between an OK personal trainer and a great one isn't the program they give a client; it's their ability to keep that client working and coming back through thick and thin! Jon Goodman loved being a personal trainer. But even more than that, he loved the potential trainers have to improve the health of the world one person and one relationship at a time. Trainers just needed the right information, so he decided to give it to them. A few years ago, Goodman put aside his clipboard and started the Personal Trainer Development Center, a website after Bodybuilding.com's own heart, with its wealth of free information published daily. Numerous top trainers contribute regularly on everything from self-marketing, rehab, niche populations, and client retention. If you're in the business and this isn't in your bookmarks, you're welcome. 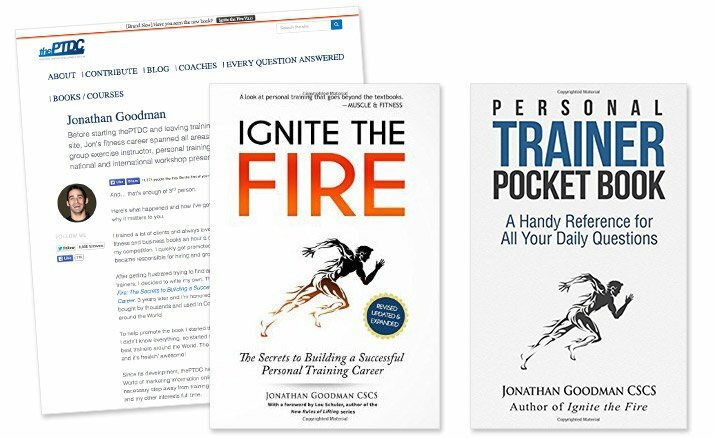 Following the release of new expanded editions of his two indispensable PTDC-published trainer guides, "Ignite the Fire: The Secrets to Building a Successful Personal Training Career" and "Personal Trainer Pocketbook: A Handy Reference for All Your Daily Questions," Goodman recently talked with Bodybuilding.com about some simple rules all trainers could keep in mind to make their foothold in a contentious industry. Many people probably think they could or should be a trainer. How do you know if you're the right type of person for this job? There's not one clear-cut answer to this, because there are so many different types of trainers. But successful trainers know what kinds of clients they work well with, and which kinds they don't. A lot of problems are caused by trying to work with the wrong types of clients before the trainer is ready. The reasons for this are numerous: pressure to sell, lack of understanding of the nuances with different populations, etc. At 21 years old, my first client was a 15-year-old who wanted to put on muscle, and my second client was a 67-year old grandmother with arthritic fingers and a torn ACL ligament in her right knee. I wasn't ready for her. It was a miserable experience for both of us. I took her on because I didn't know better. My gym's management gave her to me because she had a credit card. A lot of problems are caused by trying to work with the wrong types of clients before the trainer is ready. Often, a trainer just starting out only knows how to train one person: himself or herself. They've likely had success with their own fitness and have been on a journey of sorts—losing fat, building muscle, combatting an injury, or any combination of the three. As a result, new trainers should work primarily with situations that are familiar to them. There's nothing wrong with taking on challenging clients, but a new trainer shouldn't be thrown into the fire. At any given time, a new trainer should take on no more than one or two clients different from what he or she knows. This way, that trainer can spend adequate amounts of time researching whatever the client is dealing with. Over time, of course, you should build up a wider range of experience and expertise. You call training "the most satisfying, exciting, gratifying career in the world." What made you realize you wanted to transition from training to helping trainers? Pretty soon after I took on the senior trainer role at my club, I realized that something was wrong with how trainers were being educated. At the time, I was in charge of hiring, onboarding, and mentoring trainers. Not only were these new trainers nervous—as they should be with any new job—but they had no idea how to educate themselves. And this is what bothered me the most. Not knowing is understandable, but not knowing where to learn is a serious problem. Compound that with the media and persuasive marketing from everybody who sells training "certs," and it was impossible for a new trainer to learn from an unbiased source. I started to notice what the real difference was between a successful trainer and one that struggled. It's pretty simple: The most successful trainers understand that they are offering a service. A successful trainer is in the relationship business. People buy trainers, not training. What followed on my end was a deep dive into the soft sides of training—everything from psychology, marketing, and networking to relationship building. A successful trainer is in the relationship business. People buy trainers, not training. Most paying clients can be classified as beginners with less than 1-2 years of serious training. Some have been in the gym longer than that, but without 1-2 years of real experience intently following a program, I'd still classify a client as a beginner. For these people, the importance of the quality of the program pales in comparison to the importance of actually following a workout. Adherence is key. For most people, there's no magical program. Most programs will be "good enough" for the majority of personal-training clients. The best trainers understand that their jobs are to get a client to want to do the workout and encourage them to stick with it through thick and thin. A good trainer knows that achieving fitness is simply the result of a lot of small consistent efforts done over a long period of time. It all comes down to coaching principles and psychology. There are so many ways to get fit: walk, train at home, play sports, work along with YouTube vids. How important is it to work out in a commercial gym? Different people are different—it's as simple as that. For some people, working one-on-one with a trainer is great; for others, it's petrifying. Some people are able to follow a magazine workout, while others will fall into the program-hopping trap when the next issue comes out and never progress. Speaking in sensationalistic generalities is the biggest mistake that information publishers make in this industry. The best doesn't matter. What matters is what's best for a specific person. To find out what's best for somebody comes down to simple trial and error. Find something and stick to it. Self-efficacy—the belief that one can achieve—is largely determined by one's belief that a workout will work. I should also note that the business of selling fitness information and encouraging long-term substantive change are two different businesses. There's not a lot of money to be made by encouraging somebody to find something that works and giving them the tools to stick with it, so there's always a new fad or way to lost fat or gain muscle that's called "the best" for whatever reason. And there's value in this. Self-efficacy—the belief that one can achieve—is largely determined by one's belief that a workout will work. It's also an important determinant for adherence. Self-efficacy is also determined by whether somebody feels that what they are doing suits their needs. This is where trainers come in. If you make the workout specific to a client, and ensure that your client knows how and why the program is perfect for their emotional reason for being in the gym, they'll stick to it and not fall into the trap of following the newest next best thing. How have you gone about trying to convince trainers of their importance? What has worked, and what hasn't? I've been on a mission to gather as many quality resources under one unbiased roof with as much free material as possible. Doing this devoid of bias—we have no association with any certifying body or supplement company or anything else—has allowed me to maintain autonomy and publish the best material from as many different angles as possible. I don't know what or who is right or wrong. My aim is simply to put everything out there and let people decide for themselves. This shouldn't be a unique approach. What should be in every personal trainer's desk? I also help trainers identify where their true value lies, and it's not in building a program; it's in appreciating that they are there to be a coach. Programs are a dime a dozen. Anyone can come to Bodybuilding.com and get a free program that's probably technically better than what many new trainers can produce. A trainer's value is in his or her ability to get the client to want to do the workout and stick to it through thick and thin. There's a great list in the your book about the stuff to keep in your desk. How important are the little details in the larger project of building a successful career? The funny thing about my now-famous desk was that none of it was planned. That piece came about after I finished a 14-client day—10 in a row at one point—and started to think about how the heck I did it. Other trainers I worked with would never book more than three clients in a row, and I did 8-10 in a row multiple times a week. I then realized that I had built systems into my desk to deal with anything that could be thrown at me, including client programs, hypercaloric foods (for me), protein shakes (for my clients), an entire injury file for easy reference, breath mints, and marketing handouts to pass along to clients for referrals. My best recommendation to trainers is to simply take note of what you do. Keep a page on the back of your clipboard, and write a quick note whenever you do anything in the gym. It could be as simple as picking up a piece of garbage from the floor or as nuanced as changing from a bench press to an incline neutral-grip dumbbell press on the fly because a client complained of some shoulder pain. Then, at the end of each week, go over each note you made and see where it fits in to your overall business. Think of it as your "examined life" as a trainer. Radio and TV commercials make it sound like personal training is an exploding industry. Is that accurate? How is that different than when you started training? [Laughs] I haven't heard those ads. The industry is growing quickly for sure. But it's also growing in a lot of different directions. Trainers are starting to recognize that they are also trusted fitness and health-information providers, and there's a lot of value in that as well. Additionally, there's a low barrier to entry. It's become much more commonplace for a regular person to have some interaction with a trainer, either one-on-one or in some sort of a group setting. When I started training, it was more of an underground movement. Hiring a trainer was something the rich did. Now it's become much more commonplace for a regular person to have some interaction with a trainer, either one-on-one or in some sort of a group setting. Nevertheless, obesity rates continue to rise and health care costs are crippling societies. The only solution is preventative medicine, and exercise is the best kind. Trainers are on the front lines. It can be difficult to get a person to pay money now with the idea that it will help them get less sick later. The solution, at least how I see it, is to arm trainers around the world with the knowledge to not just build programs, but to sell programs to clients—and to coach those clients to adhere. Imagine you have every trainer in the world standing in front of you. You grab them by the collars and shout just one command in their faces. What is it? I don't care that your ex-girlfriend just went on vacation to Aruba and posted pictures on Facebook. Turn off your damn cell phone when you're with a client!